Dr. T. Adam Blackstock currently serves as Associate Professor of Percussion Studies at Troy University, and as Principal Timpanist with the Northwest Florida Symphony Orchestra. His duties at Troy University include: teaching private lessons and percussion methods courses and leading the award-winning Troy University Percussion Ensemble – winners of the 2012 and 2015 Percussive Arts Society International Percussion Ensemble Competition. In addition to performing recitals and administering clinics throughout the United States, Blackstock has performed internationally as a guest soloist in San Juan, Puerto Rico; Vilnius and Kaunas, Lithuania; Wroclaw, Warsaw, and Kolbuszowa, Poland; and most recently in Prague, Czech Republic and Manchester, England. 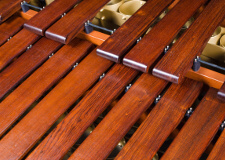 Blackstock has been featured as a marimba soloist at three Percussive Arts Society International Conventions (2008, 2010, and 2011). Ludwig/Musser Percussion, Black Swamp Percussion LLC, Innovative Percussion Inc., Remo Inc., Sabian Ltd.